Nanette's Cottage and other artwork by artist Thomas Kinkade can be viewed in our artist slideshow. 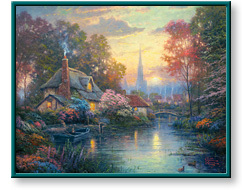 Nanette's Cottage by artist Thomas Kinkade and other Thomas Kincade art, art work, artwork, canvases, giclees, images, limited editions, open editions, paintings, paper, pictures, posters, and prints can all be found at Christ-Centered Art. "Peacefulness and tranquility are such precious commodities. As I look upon the undisturbed waters which surround Nanette's Cottage, I am reminded of simpler times in my own life." "Some sixteen years ago, I had the chance to lead a quieter existence — some might even say that it was during this period that I first learned the serenity that has become the essence of my art. It was during an extended stay in southern England that I first discovered that life moved at a kinder and gentler pace for those who would seek it." Nanette's Cottage by artist Thomas Kinkade as well as other open and limited edition inspirational paper art prints and canvases, giclees, images, lithographs, paintings, pictures, posters, and reproductions by renowned Lightpost Publishing, Media Arts, and The Thomas Kinkade Company artist Thomas Kincade can be viewed and purchased at special sale prices at Christ-Centered Art.